Hi, my name is Joe, but most of my friends know me by my long-standing nickname of Crunchmeister, or just plain “Crunch” for short. For reasons still unbeknownst to me, I’ve decided to put together this blog to document my adventures in astrophotography. It’s not a serious thing, but more of a spot where I can share some of my photos and explain them in more detail than I can off of just my Flickr page. At the time of writing this first blog entry, I’m still very much a novice when it comes to astrophotography, and I’m still working hard to figure out what the hell I’m doing. And even as an amateur astronomer, I’m a casual observer at best. It’s been an intimidating learning process so far and at times I feel like I’m drinking from a fire hose (particularly with Photoshop processing), but I’m seeing improvements already and starting to understand things better. I’ve had an interest in astronomy my entire life. I was fortunate enough to grow up in northern Quebec (that’s in Canada) in a small mining town up in the sub-arctic tundra. We had very little light pollution other than street lights from a small town, and we were treated to spectacular displays of aurora borealis on such a regular basis that, especially as kids, we took it for granted. I didn’t have a telescope or even binoculars, but from the limited reading material I could find on the subject, I knew more than the average kid my age. Or even more than the average adult. I could find several of the major constellations, I knew where the Orion Nebula and Andromeda Galaxy were, and I knew a few star names. I understood the concepts of things like the ecliptic plane, equatorial motion, albeit very basically. I understood the units of measurements like AU and LY. It was all superficial knowledge, it was a nice foundation to build upon later in life. Alas, I never really “took up” astronomy in my youth, even though I wish I had. I spent a lot of time lying on the ground outside staring up at the dark skies, auroras, and occasional meteor showers, but never took it farther. I never got to look into a telescope until I was over 30 years old. By then, I had been living in the city since I was 18, and hadn’t seen dark skies or an aurora since my youth. That first telescopic view of the night sky was inspiring. One autumn evening in about 2000, I was visiting friends who lived out in a log cabin out in the boonies far from any city lights. A neighbour had stopped by with his Skywatcher 4.5″ reflector on an EQ mount. The EQ mount baffled me, and even the owner had no real idea how to use it. But to be able to point it up and see starfields, clusters. 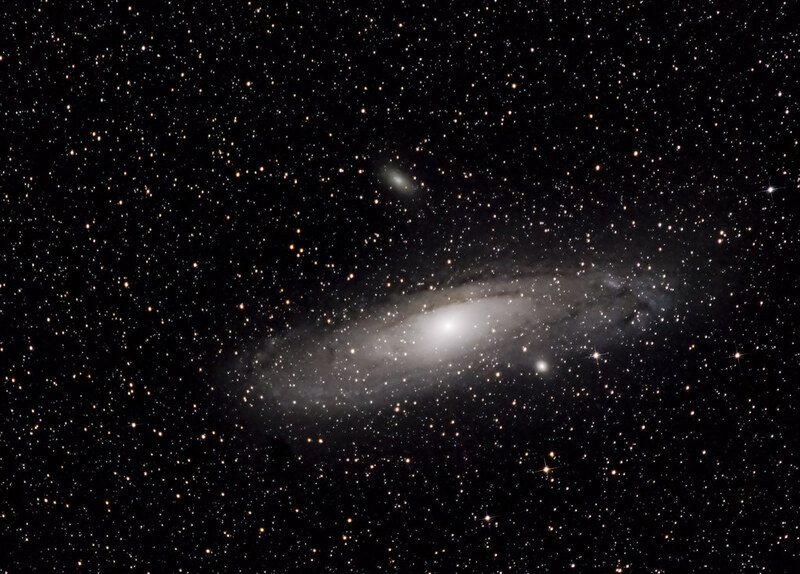 And then there was the first view of M31, the Andromeda Galaxy. I knew I NEEDED to get a telescope and try this for myself! I ended up borrowing small scope from my friend for a few weeks. It was a horrendous little Bushnell 60mm refractor on a rickey alt-az mount equipped with cheap 0.925″ eyepieces. While pretty much useless for anything other than the moon, I did spend many hours examining the moon all while cursing out the shaky mount. I knew I needed something better. Eventually, I bought my first scope, then a second, then a third, each time moving up in size and capability. And I enjoyed my views of the universe. But of course, aperture fever is strong, so in 2010, I decided it was time to stop playing around and buy something more serious. I picked up an 8″ Meade LX90 ACF, which is still what I’m using as my main scope at the time of writing this blog. Naturally, with that kind of equipment, the interest in actually documenting my targets via imaging became interesting. I knew I had a good foundation for astrophotography with this telescope. It was in the fall of 2012 that my friend Kevin started really talking about astrophotography. He had a Nikon D60 DSLR, and I had a scope. So if we combined our equipment together, we might just be able to take some pictures! Neither of us had the foggiest idea of what we were doing, but were willing to learn. Kevin ordered a T-mount and adapter for his Nikon camera and we proceeded to unsuccessfully try to take images of the night sky in the early summer of 2013. At that point, we were trying to take shots of Saturn, but it didn’t work out too well. It wasn’t until Sept 15, 2013 that I finally did a bit of research on how to do deep sky imaging and processing and we tried our first deep sky image. 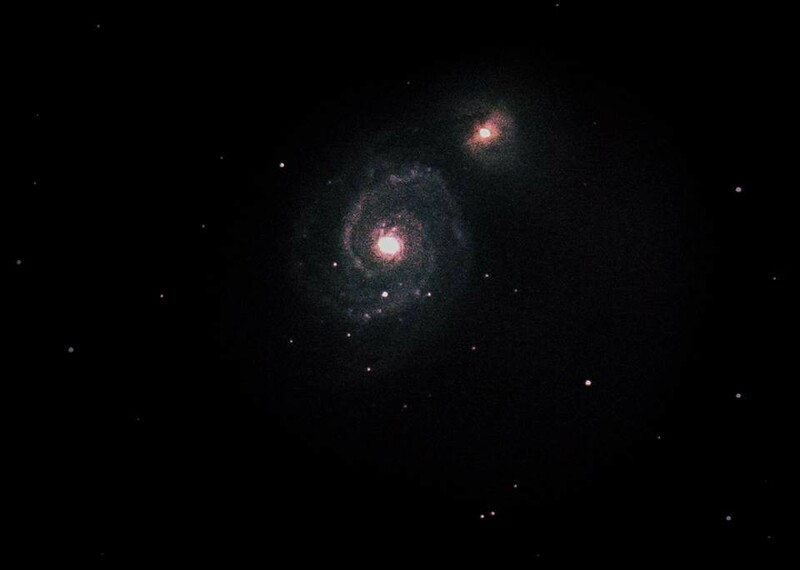 The target: M51 The Whirlpool Galaxy. This was the trigger that got us going. We had a few failed attempts (particularly with M31) from that point on where we got dewed out, clouded out, etc, but this image was the catalyst that got me dedicated to being able to capture high quality images of the celestial wonders I was seeing. Since that fateful first image, Kevin and I have made several attempts. Most have ended in failure for some reason or another. When Murphy’s Law strikes, it strikes hard. So I eventually went out and bought myself a DSLR camera – a Nikon D7000 – so I could have my own gear and be able to practice outside of the once every couple of weeks Kevin and I could get together. I’ve had some luck by myself and managed to get some nice initial results, despite being a little limited by incorrect equipment. Over the past few weeks, I’ve closed that equipment gap. I have a proper T-mount that attaches to my rear cell on my scope, an EQ wedge, piggyback mount, filters, telecompressor and some other odds and ends in hopes that I can take the best pictures that I possibly can. And I did have some measure of success! I managed (after many failed attempts) to take an amazing shot of M31 using my camera with a 55-300mm zoom lens mounted in a piggyback mount on my telescope! So that’s it for a rather long-winded introduction. I’ll post again once I have something worthwhile posting.